Leanne qualified in April 2016 having been a student here at Damory since June 2013. She enjoys all aspects of nursing, especially theatre and critical care. 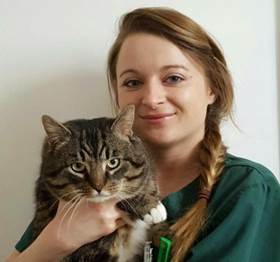 Leanne has a particular soft spot for feline patients and is our cat Advocate for the practice. She can also be seen out assisting with our equine and farm vets. She lives in Dorchester with her pony, Jess and her three rescue cats, Boo, Tia and Sherman. In her spare time Leanne enjoys hacking out and competing at local shows with her pony, photography and has recently started to learn the guitar.